Hi Stuart very well done, its all taking shape now. Towngate Motors on Northfield Road were Datsun dealers, [their Radio Hallam jingle was `Tiptoe down to Towngate`] The name of the business originated from their first premises on Towngate Road Oughtibridge. 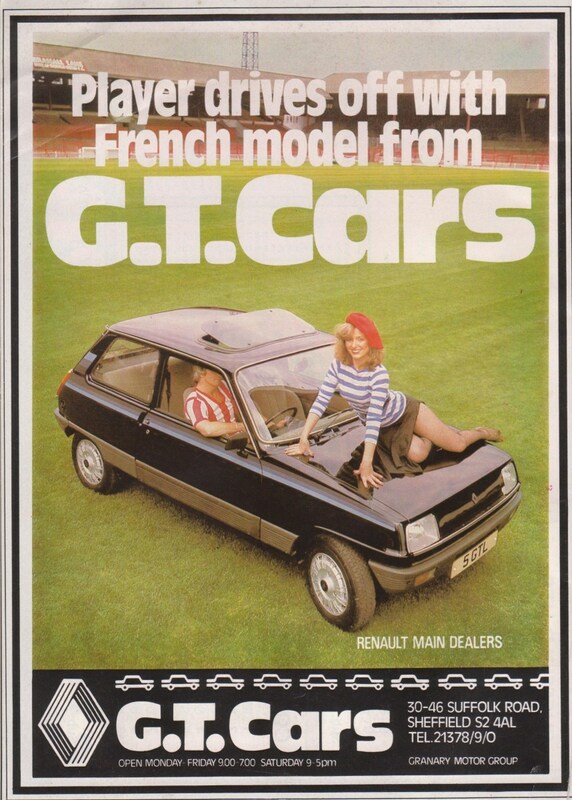 Where they also Renault at one time? Sheaf Motors, Honda. They had a couple of sites over the years. Copal Aston is strictly outside, but they had at least one on woodseats - the opposite side to the libary, and may also have had the garage just below the abbey pub. I can confirm that Brocklehurst's was Rootes group. There have been a few garages at Woodseats, but only 1 remains, the present Honda garage, thats been there a number of years with different owners/franchises. 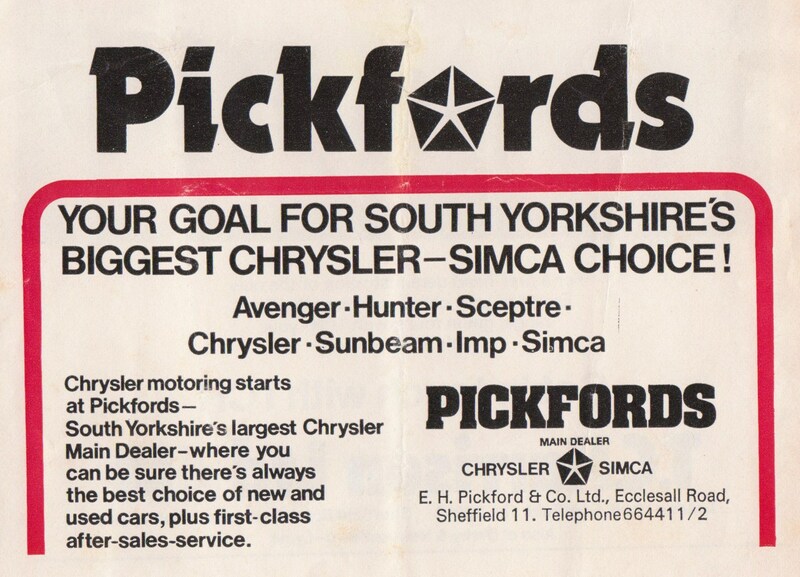 Woodseats motors were where KFC is and at the junction of Chesterfield Rd and Scarsdale Rd I believe they sold Renault, perhaps Mazda in later years. The Mazda dealership moved down to London Rd into custom built premises on the site of Heeley Cinema, this has now been rebuilt into an extension of Pondsfords. I could do with some confirmation for these. Peter Brooks Honda. Their Woodseats premises over the years have been the home to various makes of car. I can only go back to 1962 the year my dad bought a new Bedford van when it was Jack Marshalls a Vauxhall Bedford dealer. Shortly after that Fred Wilson opened up in brand new premises at the junction of London Road and Hill Street also selling Vauxhalls. W/E. Another vague memory. Didn't Hatfields have a very small unit on Norfolk St? Oughtibridge. But what about Monty's Motors of Oughtibridge which now goes under a different name. Yes, you are right it was Worrall. 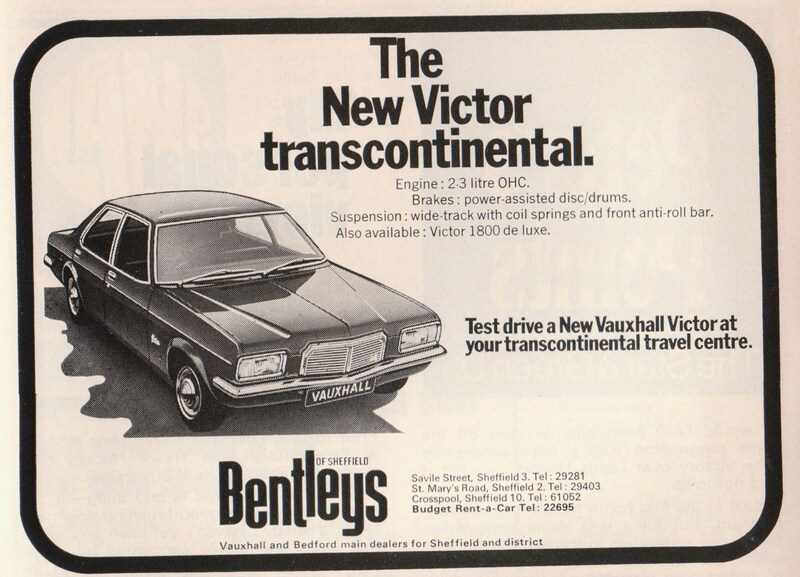 It was the Oughtibridge bus I caught to get there, came back with a Vauxhall Ventora. There's a picture somewhere on Picture Sheffield. I worked for a short time for Hillsbrough Garage and Motor Company who had their main garage on Bramall Lane (which doesn't sound right if you are a football fan) . They sold Jaguar, Standard Triumph and Rootes Group in 1965. They also had a garage on Langsett Road which had a BMC franchise and City Road Service Station which sold Vauxhall. I was a salesman and didn't last long! 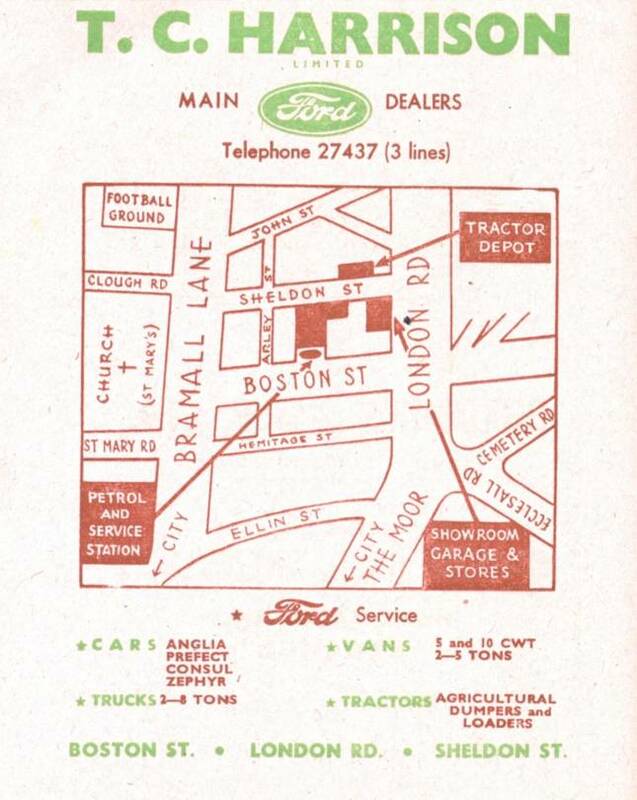 Richard mentions Brook Shaw's, I remember Brook Shaws on Gibralter St as a Ford dealer and have vague memories of then at the corner of Norfolk St and Charles St, was the Norfolk St site a Ford dealer as well? Could you buy Fords anywhere else? It was a United vs Wednesday County Cup programme! I have though got thousands of football programmes & lots of United ones. Wasn't there a GT Cars, Renault dealer , near the bottom of Granville Road across from the B&C chapel of rest? Also across the road just past the Wicker arches on Snig Hill Bentley Brothers sold Bedford vans. Wigfalls had their vans from them with specially build bodies. Much has been written on this site about car dealers and garages in general, the last topic I recall is the Deighton Motor Company Topic. What is needed is a definitive list of who sold what and when and where. Please provide as much information as you can, I think this is a topic which every member will be able to contribute, as we all have either bought cars or still buy cars. Some members will have memories further back than others. Way back in the 1970's I bought a nearly new canary yellow Vauxhall Viva. 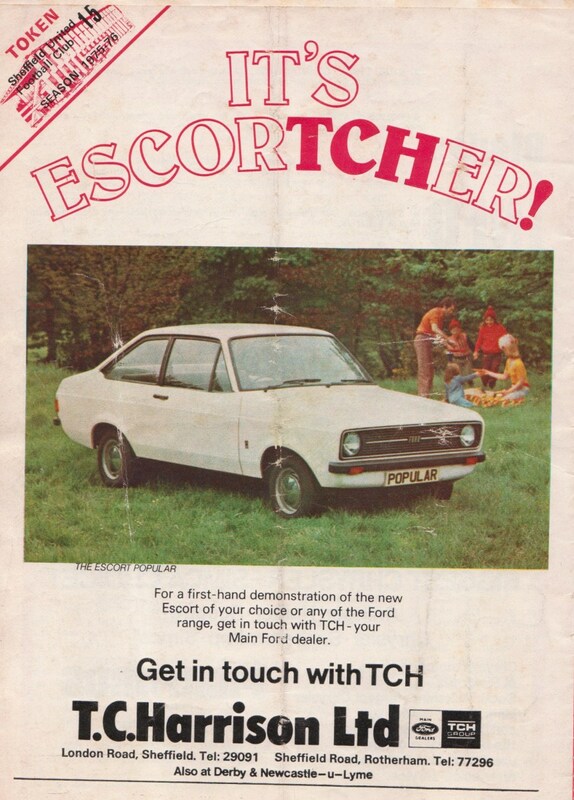 It was an interim model, a sort of cross-over between the HC Viva and the Chevette. It had the Viva HC body with "Shovitt" underpinings and engine. It was called a Viva 1300. When I came to buy new brake pads I found that one side was fitted with a Girling system and the other with Lockheed ! I eventually went to Bentleys and was told that there were a lot of cars produced by Vauxhall at that time fitted in a like manner and that braking performance was not affected. They willingly sold me an odd set of pads out of two different boxes and that was that. The following winter the car was pranged when someone tobboganned out of a side street on ice and stove the back door and wing in. I took it to Bentleys bodyshop which I think was located at Darnall or somewhere and they did the worst paint job in history, talk about two-tone. The problem was the yellow faded very quickly and they had to spray it about 3 times before it bore any resemblance to the rest of the car. I seem to remember that when Bentleys were in financial trouble they leased a lot of new cars and sold them outright to people. I can't remember the outcome but I think the leasing firm tried to reclaim the vehicles. I think the Bentley Brothers garage at Crosspool had an agency for Colt cars as my neighbour bought several from them. "Red hat and no nickers", or in some places "red shoes and no nickers" refers to women who pretend to be rich and posh but in reality they are poor and ordinary. They tend to have an exterior appearance of wealth (red hat / red shoes) but it is just a show and they have had to sacrifice the hidden basics (no nickers) to achieve the image.